Customers are particularly impressed with Airbus' progress on the design of flexibility and reconfiguration enablers when being presented the cabin design progress. "The customers demonstrated the functioning principles and were delighted at the response," Jonathan Norris, head of cabin and cargo A350 programme says. "The airlines were particularly happy to see this aspect being included up front in the design process." The ability to reconfigure the interior of the A350 quickly and simply across galleys, lavatories and all passenger classes, is a priority, says Ilke Calis who is in charge of enabler development. 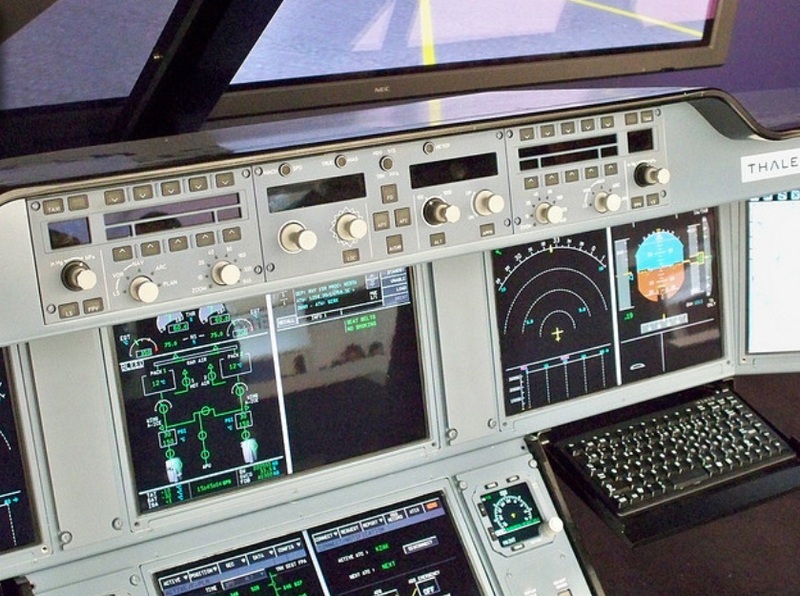 "Enablers are the key interfaces between cabin components - standardising them will reduce installation and reconfiguration lead times for airlines and thus save them money," he says. A team of 20 from cabin engineering, the final assembly line (FAL) and external suppliers has been working to develop prototype enablers, each of which has been videoed and timed during trial installations in the cabin mock-up. The team also performed an extensive internal benchmark with other FALs, with for example, the monument upper attachments chosen coming from the A380 cabin. "We are very pleased with results so far," Ilke concludes. "We are very close to our time targets and final selections and are currently fine tuning our concepts. We have made significant architecture advances too, such as the new seat-to-seat connection, combining the power and data cable in a single harness, meaning it is considerably lighter and more reliable." The modular cabin layout can be reconfigured overnight to allow airlines flexibility to adapt for seasonal needs. MSN001 flight test “supercomputer” requires 67km of cables. 50 metre-long & 900kg. electrical harnesses manufactured by Labinal, already installed. A350 XWB 1st aircraft (MSN001) moved another step closer to its maiden takeoff with installation of 50-metre-long electrical harness for flight test measurements, which – together with 35 electrical cabinets – forms an advanced “supercomputer” known as METRO. 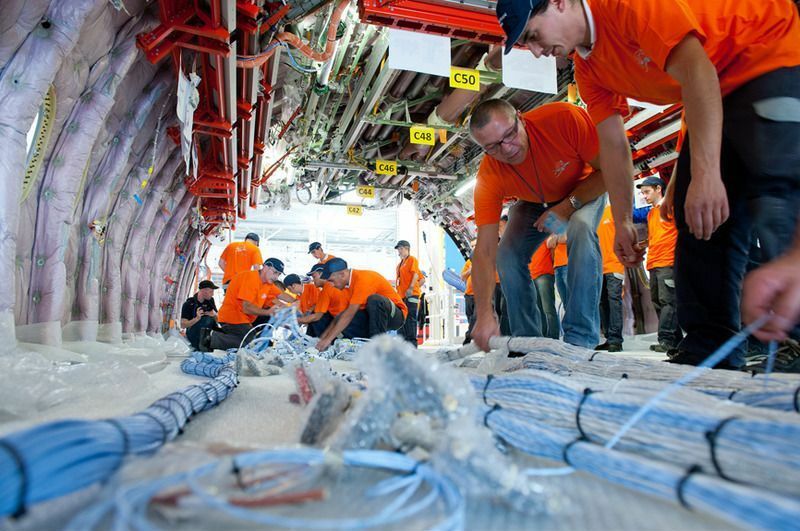 Outfitted with 40,000 electrical links, the METRO system allows a range of parameters to be measured and recorded during the aircraft’s flight test campaign, with data collected to be used for the A350 XWB’s certification process. METRO will be powered up in coming weeks and will allow 4,500-5,000 measurements to be made. 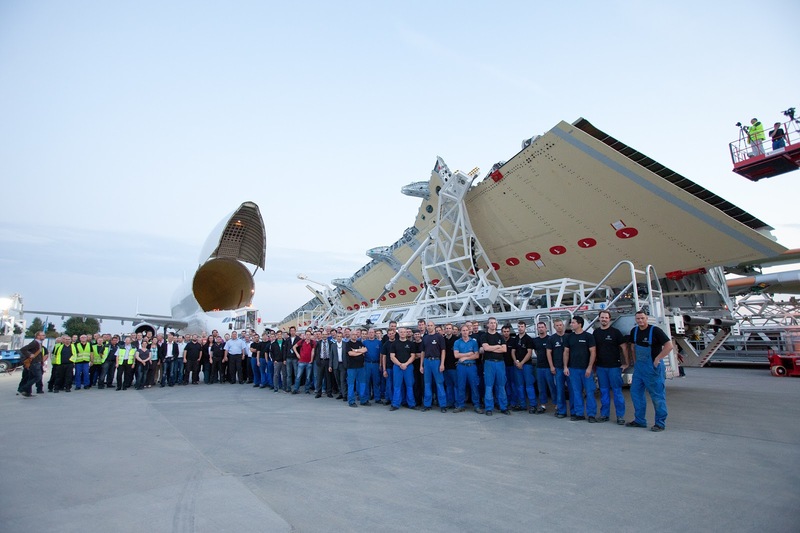 The system’s electrical harness, which weighs 900 kg., was installed in October by more than 40 employees from Airbus and the Safran group’s Labinal. Its placement was completed over a weekend to ensure the A350 XWB industrial timetable was not impacted. For the first time, the harness – with its 67 km. of cables – was installed in high-level raceways. This approach differs from previous programs where harnesses were run along the floor, and it will eliminate the risk of electrical equipment damage during final assembly line activities. The METRO system’s circuit also is more flexible. Electrical cut-offs, which are possible at each of the 35 cabinets, allow them to be disconnected and moved in an easier and faster process. 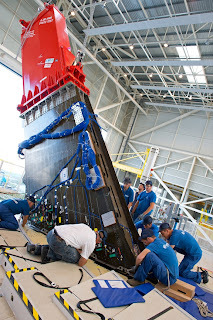 The cabinets – which weigh a combined nine tonnes – will be used by flight test engineers to display parameters being tested and recorded during the flight campaign. MSN001 is the first will be joined by 4 additional development aircraft in the flight test campaign, each equipped with different instrumentation to gather the range of information required for certification. Based on press release of Airbus "A new A350 XWB production milestone: making way for METRO"
Cathay Pacific optimistic with A350-900 economics, prepares for new routes in 2016 to connect Hong Kong with Berlin, Manchester, Madrid and other hubs in North America. Cathay Pacific believes that the superior "economics" of the Airbus A350-900 will allow the airline to open up more than a dozen new points in Europe and North America from its base in Hong Kong. 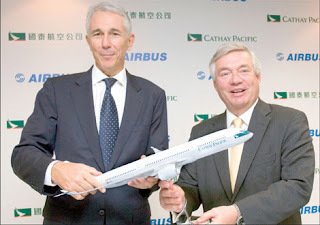 Calling the A350-900 a "really strategic aircraft", Cathay's chief executive John Slosar said in a wide-ranging interview with Flightglobal that the options that it offers the airline "will be really important for us". Some of the European destinations that could open up for the Oneworld alliance member include Berlin, Dusseldorf, Manchester, and Madrid, says Slosar. 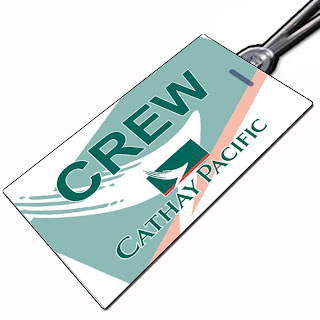 Together with the new points in North America, these will allow Cathay to offer non-stop services to Hong Kong and then connections to points in Asia. "This is why the A350-900 is a really strategic aircraft because we think the economics of that will allow us to add a lot more direct services to Europe and even some in North America on that," says Slosar. Cathay has orders for 20 A350-900s and 26 of the larger -1000 variants. It expects to get its first -900 in 2016, and Slosar says that Airbus is doing a "very good job" in managing the programme and the risks associated with it. "We are very heavily invested in the success of the A350. I will give Airbus a hat tip - they are doing a very good job with that. They say that they are going to be flying in 2013, and it looks to me like they will. And we are really looking forward to the airplane getting in the sky as a step towards delivery," says Slosar. "From what I see, they are managing the program well, and managing the risks and making pretty good progress. As much as the [Boeing] 787 was a huge story when it initially came out of 2007, it took a while, but it was a big story even when it flew two years ago. The A350 flying will be one of the huge stories of 2013." Based on the article “Cathay eyes new European and North American points with A350-900” published in FlightGlobal. 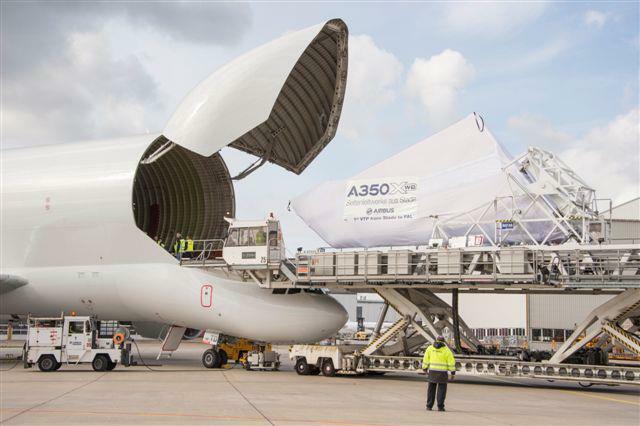 A350 XWB Belly Fairing work package for -1000 not assigned yet. Alestis Spanish Tier1 financial problems could force Airbus to move the job to France. As stated in Spanish newspapers mentioned below, it seems that Airbus has lost the confidence in Alestis and the belly fairing for -1000 model has not been automatically asigned to the same supplier that is currently manufacturing it for -900/-800 models. Alestis Aerospace, one of the three Spanish Tier1 in the A350 XWB program, is facing a cash crunch and from May this year, it was placed under court administration so it is operating from one bill to the next. 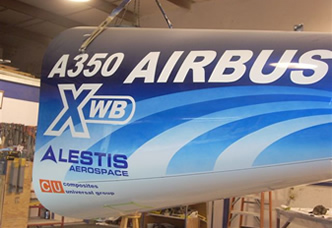 Money troubles that Alestis is facing are partially related to the heavy investments done to develop parts for A350 XWB in expectations of fat payoffs. Airbus has taken the control of the group as new CEO was former managing director of Airbus Military facility of Tablada (Sevilla). 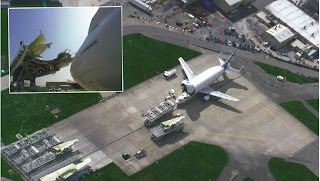 If the Belly Fairing for -1000 (currently under conceptual-design phase in Toulouse) is assigned to a French supplier –the centre fuselage is a French package-, the workshare of the A350 XWB between 4 European main Nations will be different and Spain would decrease the 11% that currently has in the A350-900, with more than 1.800 direct jobs in Spain. Meanwhile, Alestis has delivered the HTP-Tips (a subassembly of metallic and composite parts) and strakelets (2 fairing in the HTP) for the 787-9 to Boeing last week. Alestis CEO said that “Alestis will keep on demonstrating to Boeing that we are good partners, as Boeing is a strategic customer that Alestis has to take care of”. 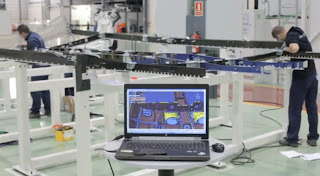 Alestis is the single source for these two work packages and there are involved 3 plants in the manufacturing (metallic parts in Miñano, composite parts in San Pablo) and the assembly (Aeropolis-Sevilla). Based on the article “El peso de España en Airbus, en riesgo por la crisis de un proveedor” published in Abc.es and on the article “Alestis se acerca al precipicio al no lograr la renovación de un megacontrato de Airbus” published in Expansión. Emirates includes the A350-1000 order in the commercial claim for A380 wing ribs repair and says A350-900 is starting to look small for them. 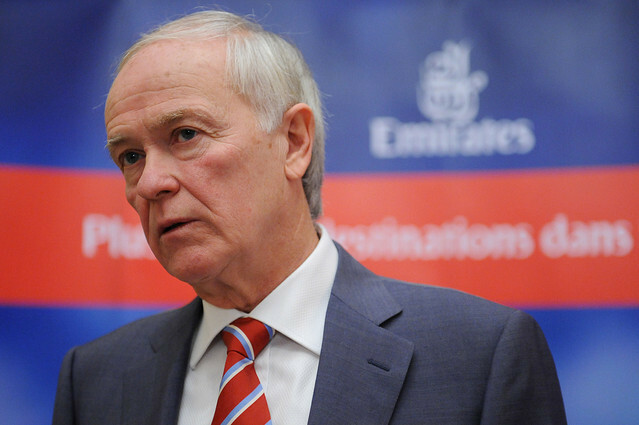 Emirates Airline President Tim Clark says the carrier’s current order for the Airbus A350-1000 is “in limbo at the moment,” but he is not ready to step back from it. 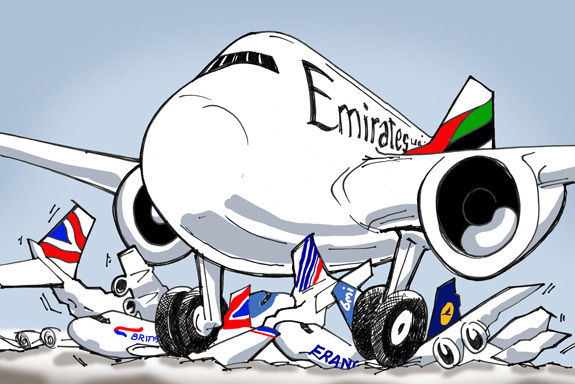 Emirates has placed orders for 50 A350-900s and 20 A350-1000s. Also, Emirates has observed a very low degradation factor: The first aircraft delivered in 2008 would normally perform around 2.5-3% less efficiently than in the beginning, but according to Clark the degradation has been only around 1%. Also, Airbus and Emirates have taken a combined 5 tons out of the aircraft’s weight. “Now roll that forward into the A350–it is late and overweight. But we got a pleasant surprise with the A380, maybe we also get a pleasant surprise with the A350-900 and -1000,” Clark says. 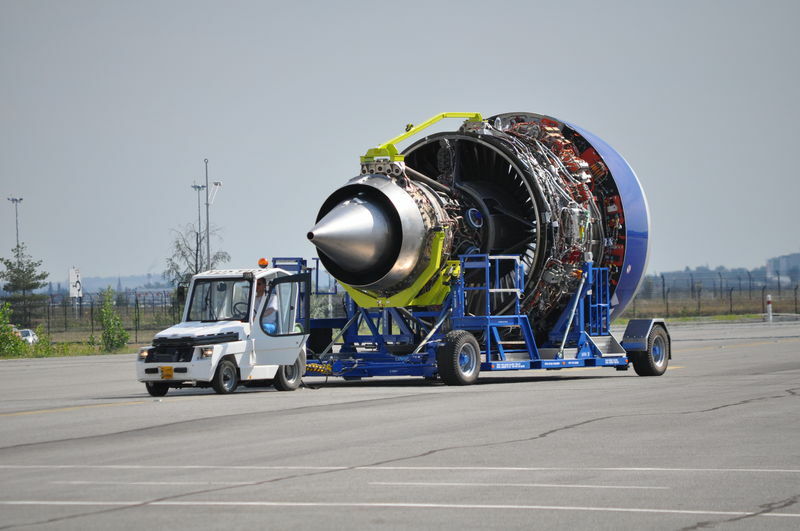 Trent XWB engine flight tests in A380 testbed just the tip of the iceberg. Certification and ramp up activities on going. 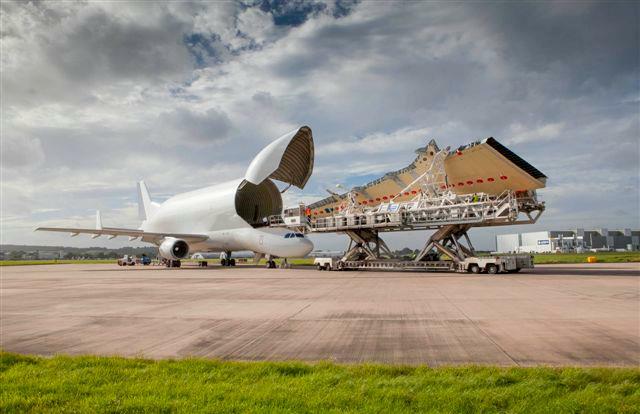 Customers have been reassured by the sight of a Trent XWB engine strapped to the wing of an A380 flying testbed. However, to Rolls-Royce this outward display of progress is just the tip of the iceberg as it works on certification and ramping up production of the first flight-test engines for the new twin. Rolls is poised to complete the final round of certification tests of the Trent XWB-84 for the A350-800 and -900, and has also frozen the design of the higher-thrust Trent XWB-97 for the A350-1000—the most powerful production engine Rolls has ever developed. As sole supplier for the A350, Rolls also knows that within six years the XWB engine will be produced at the rate of one per day—the fastest for any Trent. Airbus A350 XWB has a unique engine: Trent XWB by Rolls Royce. For Rolls this means a high tempo of work on three fronts—certification, design and production readiness. “Overall we're pretty pleased with where the program is,” says Trent XWB program director Chris Young. Since powering up the first engine in 2010 and starting flight tests on the A380 flying testbed in February 2012, the program has aimed to incorporate lessons learned into the initial engines while clearing the round of certification tests in good time for flight tests on the A350. The first set of engines for the initial A350-900, the first of the family to be developed, will be shipped to Airbus around the turn of the year. The Trent XWB has a larger fan -a diameter of 118 inches (3.00m)- than the Trent 900 of A380. 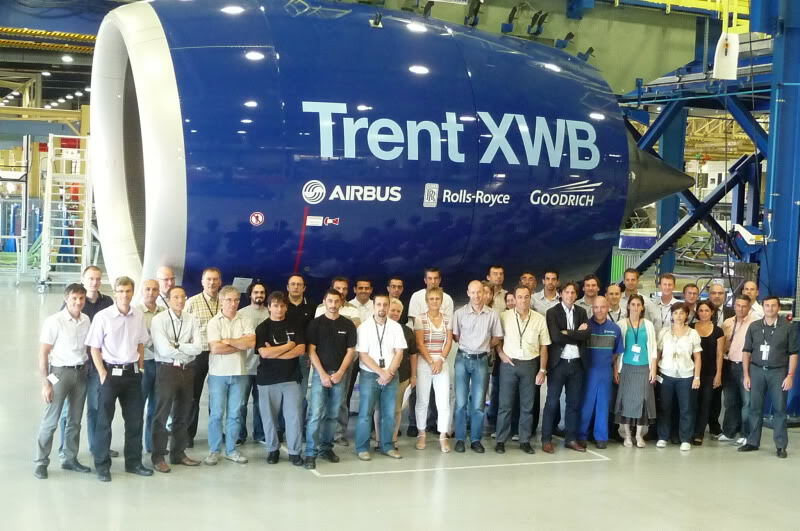 It is here that the company has put the final touches to a “training” Trent XWB, designated Engine 21001, as a key element of its preparations for the initial production standard flight-compliance engines to follow. “We invested in this specific engine, which is completely error-proofed and showed we could do it,” says Young. The engine has been used to prove tooling and train the fitters who have begun assembling parts for the first four flight-compliance engines. “Now that we've assembled it we will test it and take it apart again, and built it again several times. That way we are constantly improving our knowledge of how to do it.” Next, it will be handed to the repair and overhaul group for their input, he says. In all, Rolls plans to make 16 flight-compliance engines, 10 of which will be dedicated to A350 flight-testing. One is the already assembled training engine, three will be spares, and a further pair will be built for contingencies. The pre-production phase is “a unique opportunity to construct the engine in a single space and get the overhaul guys who work here to come over and tell us about improvements for the XWB. It will speed up the maturation process,” says Boddy, who adds that the concept was “always baked into the plan.” Although previously tried out in airframe manufacturing, Rolls believes that combining experimental, production and MRO elements into the engine development at this stage, and at this scale, is a first. 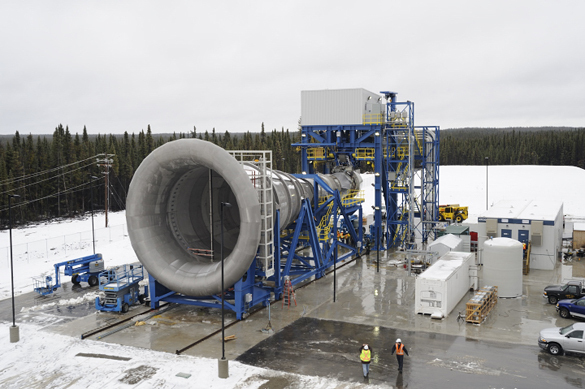 “We think this is the only dedicated pre-production facility for an aero engine in the world,” he adds. One of the final checks was a strain-gauge test of the low-pressure turbine (LPT), which was completed in mid-October at one of the company's two indoor test sites in Derby, designated the 57-bed. This was done to confirm a minor redesign of LPT aimed primarily at durability improvement, and it followed earlier tests using X-ray images of the engine while running at cruise condition. “We found the blade position was not quite adjusted right and we produced a 0.95% specific fuel consumption (SFC) improvement by changing shims,” adds Boddy. The certification finale is the dramatic fan blade-off test, which will be conducted in the adjacent 58-bed. A final spin rig test to clear the way for the blade-off evaluation is due to be run soon in Germany. 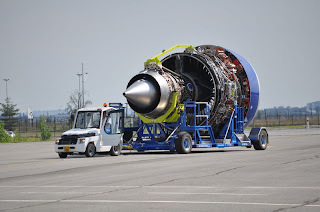 The blade-off test, in which a fan blade is deliberately detached while the engine is running at maximum thrust, will take place “a few weeks after” the test in Germany, says Young. The timetable “assumes we have nothing to analyze from it,” he adds. Other big-ticket certification tests such as medium- and large-flock bird-strike evaluations were completed earlier this year. “Both passed perfectly, and we just finished certification tests on the bill of material following the 150-hour triple-red-line test,” Young says. Airbus in UK. Without wings, aircraft don´t fly. Airbus employs around 10,000 people across its sites in the UK. The prime industrial responsibilities for Airbus in the UK are the manufacture of wings for all Airbus commercial aircraft. Additional industrial responsibilities for Airbus in the UK include Landing Gear and Fuel Systems. 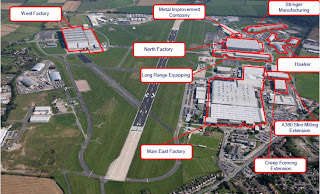 Airbus in the UK has two main sites, Broughton in North Wales and Filton in Bristol. 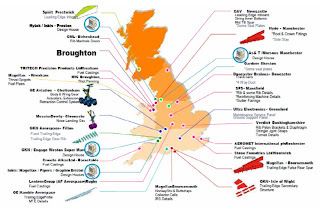 -Broughton has a workforce of 6,100 and its role is large component manufacture and sub-assembly, specifically for wing final assembly and equipping. A further 2000 people are employed on or about the site, performing ancillary activities in support of Airbus’ core operations. Broughton produces over 500 sets of wings a year, due to projected orders, this is likely to increase in coming years. The 700 acre site at Broughton has seen significant inward investment. Excluding research and development, Airbus has invested over £1.86 billion into the Broughton site during the last 10 years to create a state of the art, high tech, innovative and modern facility. - Filton has a workforce of 4,000 and its role is engineering research, technology and wing design. The A400M (multi-role airlifter) wing final assembly and equipping is undertaken at Filton. Workers are employed in the design office and in business support roles such as procurement, finance and customer service. 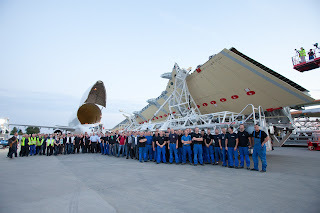 Teams work on systems, structures, wing integration, flight physics and aerodynamics research. Filton is also home to the Composite Structures Development Centre. Airbus’ presence in Filton will be enhanced with the future construction of a new aerospace business park, which is to consolidate the site’s engineering, design, customer support and other employees into one highly-efficient office block. 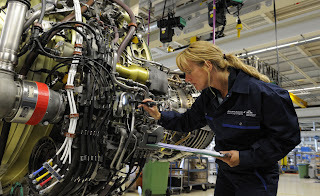 In addition to those directly employed by Airbus, the UK operation provides work for a further 100,000 people through its extended supply chain of more than 400 companies located throughout the UK, including Small and Medium Sized Enterprises (SME’s) and companies located in disadvantaged regions. 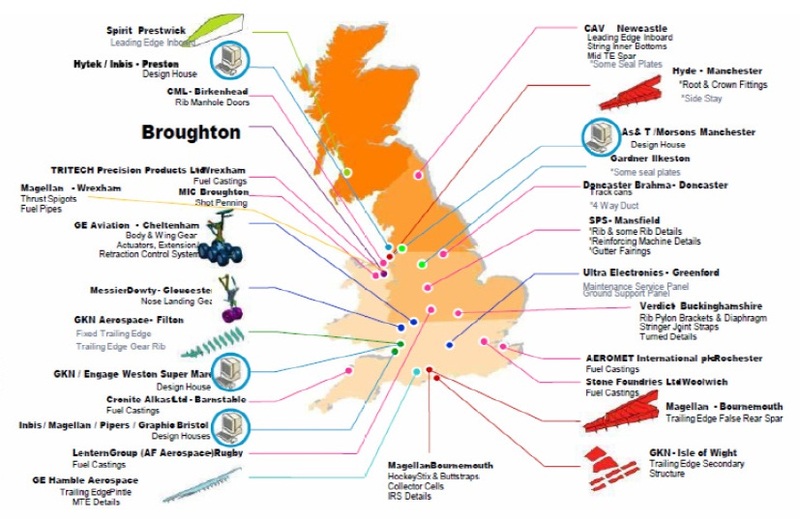 Some of the companies in the UK who directly supply Airbus with components and services to the UK manufacturing operation. Currently Airbus in the UK and its supply chain provide goods and services worth nearly £1.5billion per annum to the UK economy. Airbus in the UK is one of the UK’s biggest inward investors in research and design. Airbus in the UK has over 400 apprentices, being one of the largest engineering manufacturing apprenticeships in the UK. Airbus is the first company in the UK to offer the opportunity for apprentices to qualify in three years with a full honours degree, as well as the NVQ Level 4. This investment has meant that 70% of senior managers at Airbus started their careers as apprentices. MSN5000 Static test airframe rolled-out during a cold night in Toulouse airport. Airbus’ A350 XWB static test airframe has moved into the facility where it will undergo testing to validate the structural design. 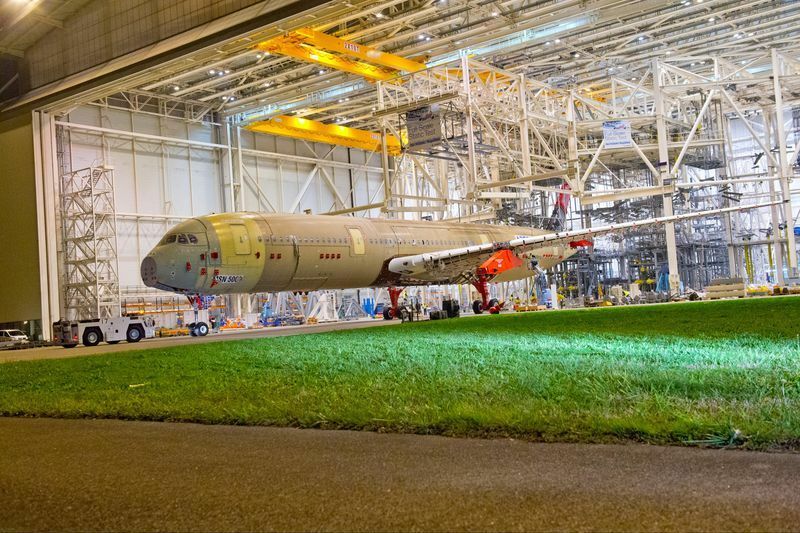 The airframe rolled out of the A350 XWB final assembly line at Toulouse, Blagnac Airport and was transferred to the L34 static test hall situated across the airport in the Lagardère industrial zone–home to the A380 final assembly line. 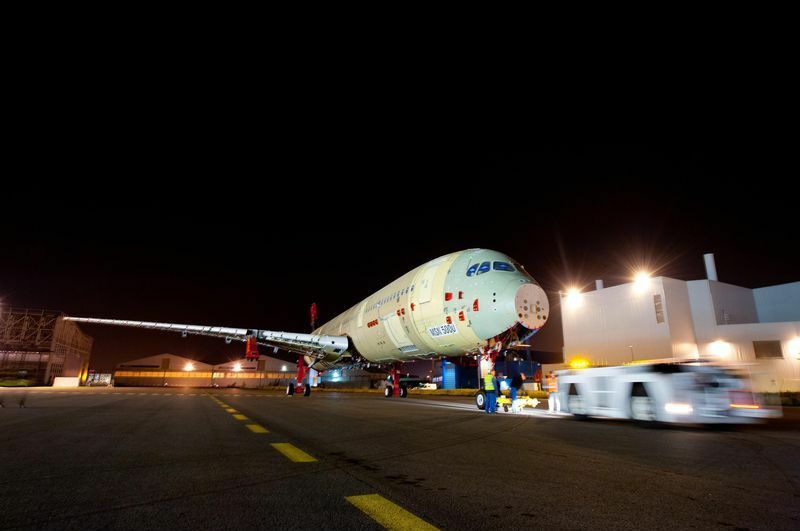 As there are no operations from 22h in the airport, Airbus had freedom to use it to transfer the MSN5000 aircraft crossing the complete airport. 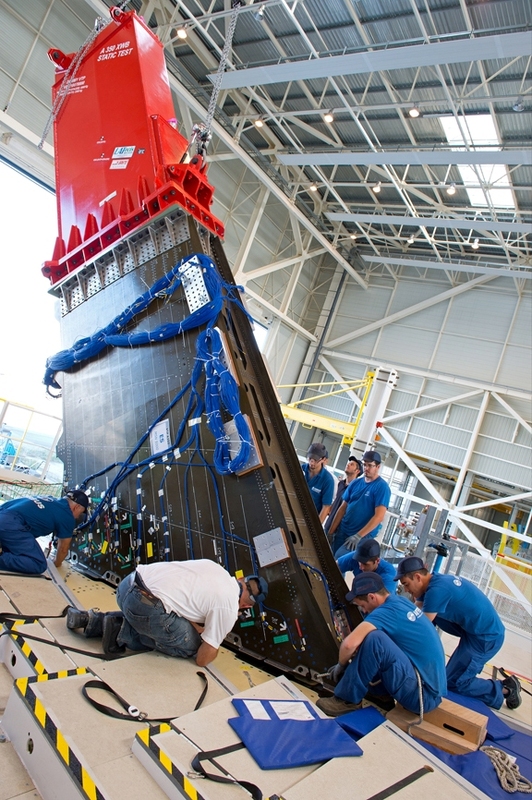 This clears the way for the A350 XWB airframe to be integrated into a test rig for a campaign that will submit it to nearly a year of evaluations, including limit load and ultimate load validations, along with residual strength and margin research. The L34 static test hall covers an area of 10,000 square meters, and is supported by 200 workers during peak testing activity. It houses a rig that incorporates 2,500 tons of steel and 240 jacks/loading lines, which are used to induce structural loads. The testing is recorded by some 12,000 sensors. Airbus’s COO Günter Butschek says production rate increase is Airbus’s single biggest operational challenge, and admits the company’s strong position is creating recruitment difficulties for its suppliers. Growth for both the biggest commercial aircraft makers, Airbus and Boeing, has created recruitment issues in the aerospace industry. 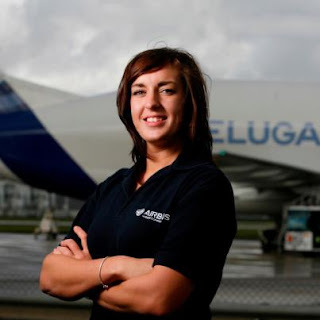 For example, this year, Airbus UK received 5,000 people to its apprenticeship open day for all apprentice positions. In the 2012 intake, the company wanted to hire 50 undergraduate apprentices – a programme that goes through to BEng level. In fact they took on 28, partly because the standard of applicants’ A Levels was not adequate. As a desirable company to work for Butschek said that Airbus was in “a luxurious position”, being able to recruit adequately to respond to the current programme ramp up and for longer term succession planning, as many engineering staff face retirement in the next 10-15 years. He said the missing middle tier of trained technical staff between 30 and 50 was not unique to the UK, being a challenge also in other countries with Airbus facilities. 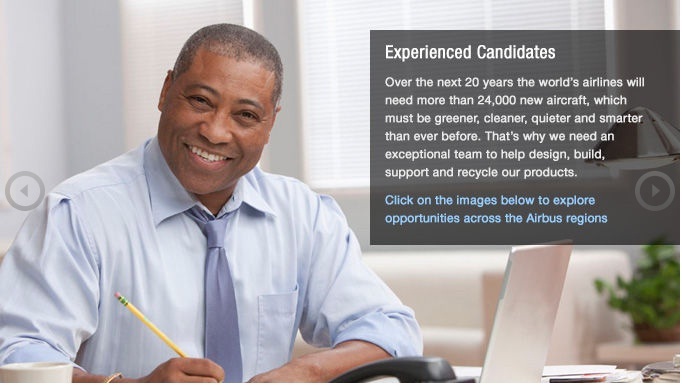 But he admitted that his company’s popularity meant that its key suppliers could be missing out on new recruits. Airbus is committed that lean manufacturing and process improvement will answer as much of the higher output requirement as possible, but capital investment will have to follow in order to reach the company’s rate targets. For instance, in the A320 program, in October production reached the rate of 42 units a month, while in 2010 these platforms were manufactured at the rate of 36 a month. 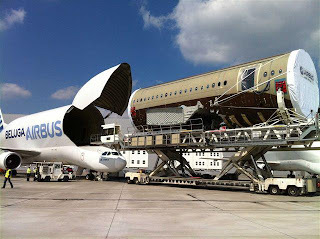 Airbus would like to increase the rate further. 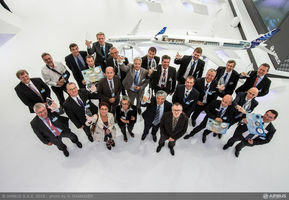 Airbus is in the process of increasing the production rate of long range aircraft from nine a month to 10 in 2013, with a plan to go to 11 by end of 2014. Production of the A380 is ramping up to a rate of three aircraft per month to keep to delivery obligations. Mr Butschek Airbus COO said it was impossible to define how much of the additional rate could be achieved through further operational efficiency gains but that this was the core focus before further capital expenditure. Before joining Airbus in March 2011, Butschek worked for Mercedes-Benz, DaimlerChrysler and other car manufacturers in global locations covering the Netherlands, South Africa and China. Airbus has cemented closer relationships with its suppliers, “most of which cannot be easily replaced” during the its latest output ramp up, says Mr Butschek, who stepped up to the COO job in June from Airbus head of operations. In response to the all families order backlog, Airbus has introduced joint improvement programmes with its main suppliers which have technical capacity constraints. Specialists form joint project teams with suppliers, to explore the details of a project to seek “sustainable improved delivery performance”. But he did not categorically rule out any financial support to key suppliers. Air France-KLM Group, said it’s seeking to wrap up the purchase of #25 Airbus SAS A350 planes in the first half of 2013 as it pushes back a contract amid arguments over engine maintenance. 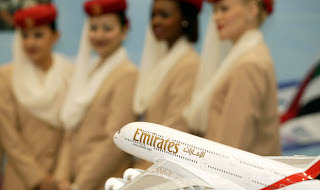 The airline had announced plans for the purchase of the wide-body aircraft in September/2011, together with the same number of 787. While the Boeing deal has been signed, Airbus is still waiting as Air France negotiates with engine supplier Rolls-Royce over maintenance. 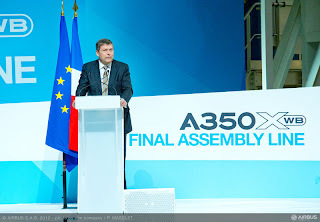 “It’s reasonable to think that the talks on A350s will be concluded in the first half of 2013,” Alexandre de Juniac, Air France CEO said today at a briefing. The French carrier is seeking to win work and preserve jobs at its Air France Industries division, one of a shrinking number of in-house aircraft servicing shops. "The issue is service and maintenance. We have a solid engine maintenance operation and Rolls has a policy of doing the maintenance itself," said Alexandre de Juniac. Air France-KLM, which is making heavy losses from its airline business, has its own maintenance and support division that is the only profitable part of the company. 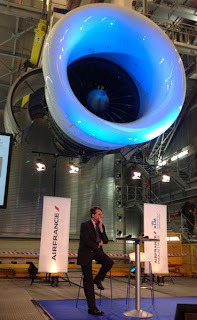 Air France wants “to be a player in the market of maintenance for these aircraft and their engines” as demonstrated in the recent inauguration of the 5.000 sq.m. 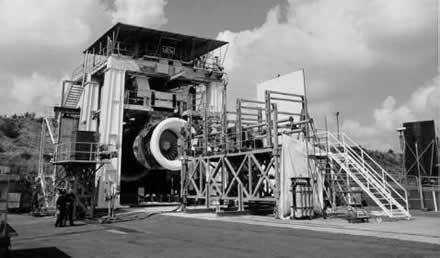 new engine test cell facility at CDG-Paris Airport with an investment of €43 million. “The test cell will enable Air France Engineering & Maintenance to cover the entire maintenance process for engines, such as the GE90-94/115 equipping Boeing 777s, the CFM56 power plants equipping A320/A340, the GP7200 engines equipping the A380, and has been designed to adapt to the engines that will equip future generations of aircraft”. For example, the 787 and A350 XWB. Rolls-Royce, the unique engine supplier for the A350 XWB, has been reluctant to grant third-party repair rights because maintenance contracts are more profitable than building the actual engines. It's worth remembering that Air France has yet to announce their engine choice for the 787 order and it could be the Rolls Royce choice to get an agreement with Europe’s biggest airline. 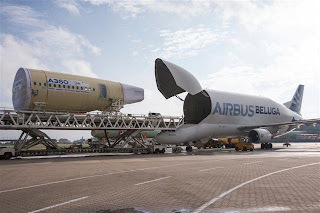 Beluga is the name of #5 modified A300- 600s that have a bulbous main-deck cargo area which enables the loading of complete fuselage sections and wings of all Airbus families aircraft (SA, LR and A350 XWB). 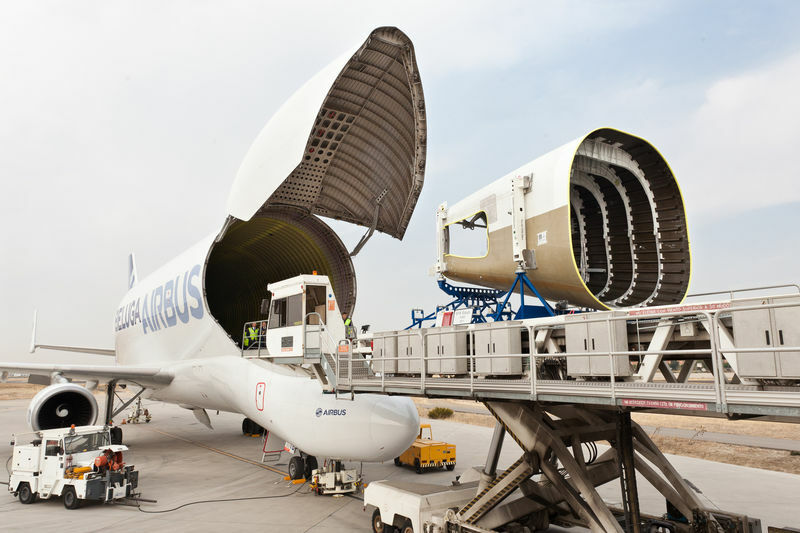 A380 parts are transported mainly by sea and by road. Hamburg,Toulouse, Getafe, Bremen, St. Nazaire, Filton, Nantes and Broughton are the production locations & final assembly lines where the Beluga flights are very familiar. For instance, the deliveries of various wing sets from Broughton take place daily, every week with up to 3 Belugas taking off and landing in each day. Due to the increased production rates a new project Fly 10000 has started implementing a program of 10.000 hours of flying per year. The turnaround time for the aircraft will be reduced to an optimum time of 1hr 30 min across all Airbus sites (5 flights/day/aircraft with 18 hours of operation, 6days/week = 120 flights/week). To reduce the effects of weather conditions on the loading process and improve the turnaround time, in all sites a new Beluga integrated line station will be built by 2014 where loading will take place inside a purpose built hangar. Each A350 XWB semiwing requires some Beluga flights from Getafe/Stade to Broughton, later to Bremen to finally fly to the FAL at Toulouse. This will ensure a ‘just in time’ program for the deliveries of various aircraft components to the FAL. Any delays in this process will have a detrimental effect on the FALs and could have a knock on effect on the FALs and subsequently on customer deliveries. The Beluga is a large, heavy freight aircraft weighing approximately 150 tonnes. The aircraft's considerable cross section makes it a unique and challenging aircraft to fly. This is reflected by only the handful of Pilots who are sufficiently experienced to fly the Beluga. The large surface area of the cargo hold makes the aircraft particularly susceptible to crosswinds (which are frequent at all 4 sites mentioned especially during winter operations) which means it requires a long and stabilized approach to ensure landing accuracy. 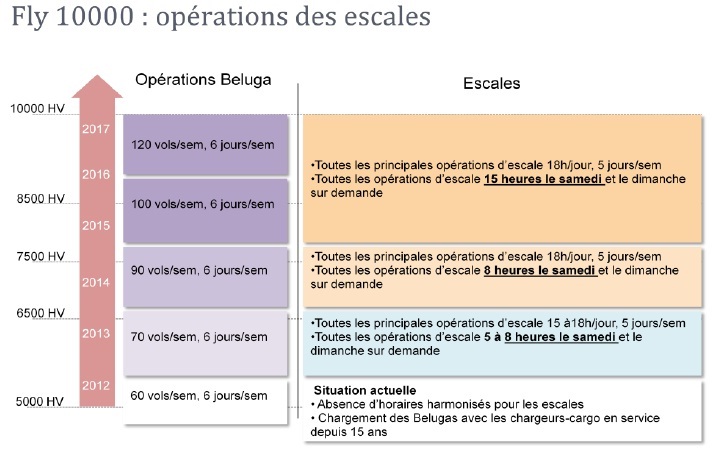 For a complete A350 XWB #46 flight hours of a Beluga are required while only #25h for a A330. 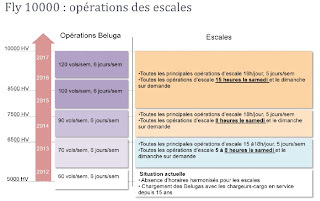 Special attention in Fly 1000 project is given to maintenance activities (to maximize availability and reliability of the fleet of Belugas), production sites (will be open 6 days/week with new loading stations) and new personnel requirements (pilots, engineers, operators will be allocated, from current 165 to 235 in 2015). Aerolineas Argentinas is in preliminary talks with Airbus and Boeing regarding an order for the A350-900 or 787-9 that could be placed in 2013, say executives in ALTA- Airline Leaders Forum in Panama City. 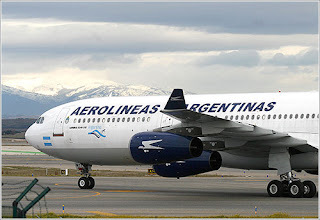 The Buenos Aires-based flag carrier is looking for a replacement of its A340 and planned A330 fleet by "the end of the decade", says Guillermo Rudaeff, vice-president of business development and alliances at Aerolineas. Aerolineas Argentinas operates a widebody fleet of seven A340-300s and four A340-200s. Mariano Recalde, president of Aerolineas, said in August that the airline is looking for up to #4 used A330s to add to its fleet, to operate on north-south routes between Argentina and northern Latin America as well as North America. Discussions with Airbus and Boeing began following a request for proposals (RFP) during the past month for new aircraft, including both widebody and narrowbody variants. Rudaeff says that Aerolineas Argentinas -SkyTeam alliance member- received "many responses" to the RFP but is focused on its future widebody fleet at the moment. 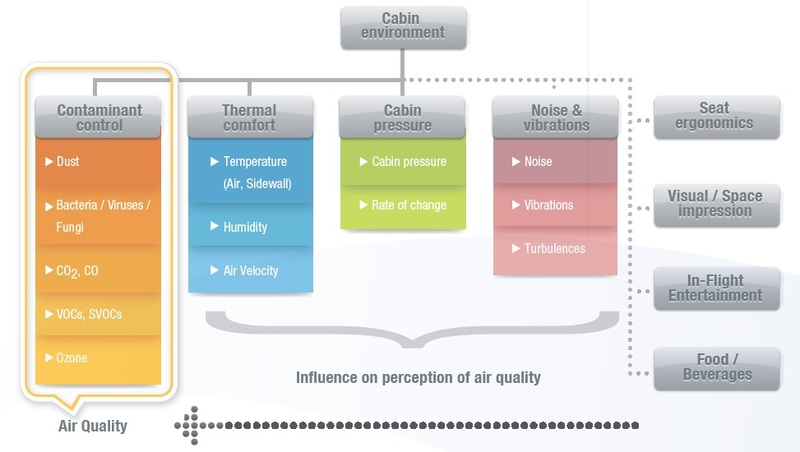 On aircraft, cabin air quality contributes significantly to the comfort and well being of passengers and crews alike. Air quality, temperature and pressure are important parameters which are directly controlled by the environmental control system. Commercial aircraft operate primarily in the troposphere and lower stratosphere, depending on their geographic position. This is an environment that is hostile to life; the outside temperature can drop to below -50C, the ambient pressure can decrease to less than 200hPa (hectopascal), which is one fifth the ambient pressure on the surface of the earth and high ozone concentrations may occur. During flight, pressurized outside air is taken from the compressor stage of the engines (bleed air) upstream the combustion chamber, where temperatures up to 400°C can be reached, passed through a pre-cooler unit and conveyed to the “air conditioning pack” at a temperature of approximately 200°C. 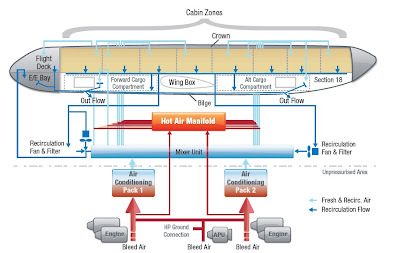 Alternative bleed air supply sources during ground, or near ground operations, supplying the air conditioning pack with pressurized and consequently hot bleed air, are the Auxiliary Power Units (APU) and High Pressure Ground Carts (HPGC). A mixer unit, installed below the cabin floor in front of the centre wing box, mixes outside air with cabin air. The cabin air is taken from the under-floor area and drawn through recirculation filters by recirculation fans. 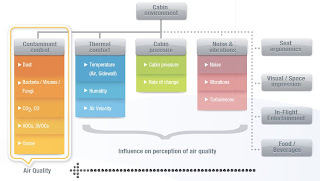 The quantity of re-circulated cabin air mixed with the outside air varies from 40% to 60% and improves efficient removal of heat loads at a moderate temperature gradient, and increases the humidity by making use of the cabin air. The latter contains humidity contributed by the passengers whilst outside air, being very cold, is almost completely dry. 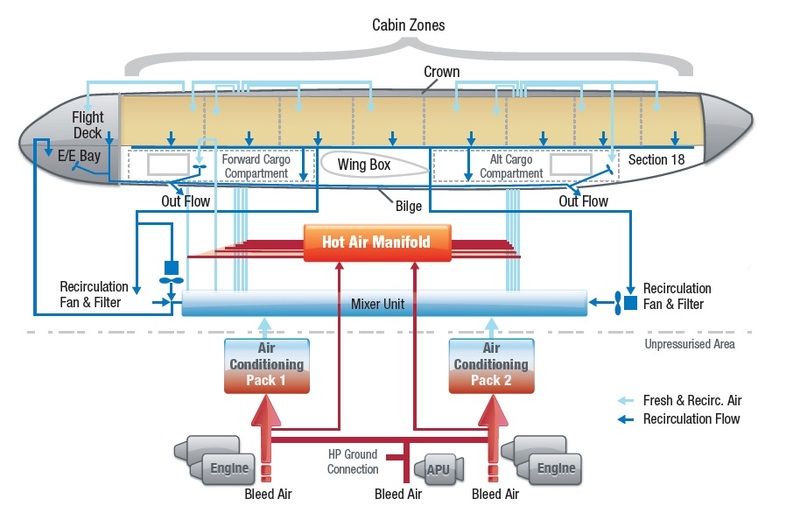 Honeywell supplies the Air Management System specifically designed for A350 XWB: the bleed air, environmental control, cabin pressure control and supplemental cooling systems. Honeywell has more than 50 years´ background in environmental and cabin pressure control systems to manage all of the air used on the aircraft for environmental control, including cabin heating and cooling, and cabin pressurization for increased passenger comfort and safety. Thales is preparing hard for one of the next milestone of the A350 XWB program to be held before Christmas; the power-on. 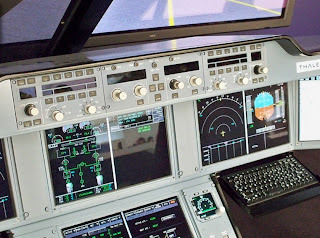 Thales was part of the power-on of the flight deck of the MSN001 prototype last 2/August at FAL in Toulouse. 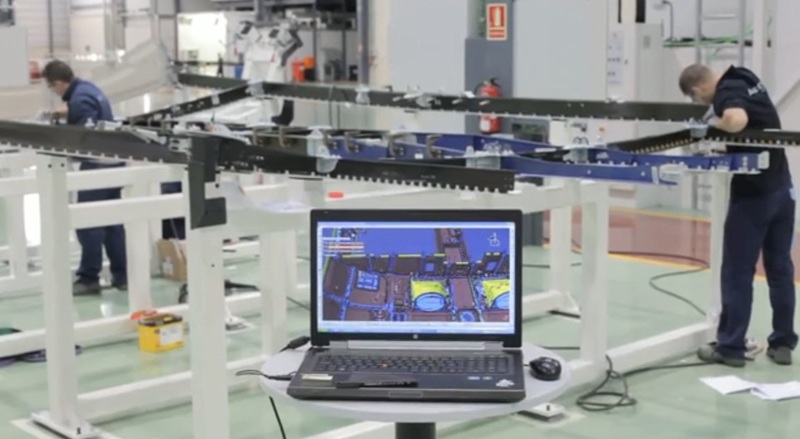 Thales provides a complete shipset of equipment both for electrical and avionics use.These equipment were tested by Airbus during the flight deck power-on and will be again tested in the fuselage power-on and later in the aircraft power-on. A member of the Thales front office team who supported the power-on said “I was very happy to notice that no anomalies were found on any of the Thales equipment and the power-on went very well. This is a proof of the maturity of our equipment and functions”. For second time in few days, another A350-800 customer has decided to convert their orders to bigger A350 version. But this time is not just “another customer”. Al Baker´s Qatar Airways was the launch customer of A350-800 and also it is the first customer for A350-900 and A350-1000 version. Qatar Airways has shifted its order for 20 Airbus A350-800s to the larger -900 variant. It will be confirmed in coming days. Speaking at a Doha press conference after the arrival of the carrier's first Boeing 787,Qatar Airways chief executive Akbar Al Baker confirmed that it had ditched its A350-800s. Its order book for the type now comprises #60 -900s and #20 -1000s and it remains the launch customer for both variants. The Qatar Airways decision leaves Airbus with a shrinking backlog for the smallest A350 variant -stands at #92 firm orders-, raising questions about whether it’ll stick with the model. Airbus has already seen several customers (around 40%) swap A350-800 orders for larger variants, most recently Afriqiyah Airways. “This is in line with market trend, upsizing to larger models,” Marcella Muratore, a spokeswoman for Airbus, said today in an interview. Muratore said she had no information to provide on which of the larger variants Qatar will take, but she said Airbus remains committed to building the A350-800. It is not a surprise as Airbus is moving in this direction since some months ago investing in an improve program for the A330 (announced in Farnborough in July/2012). Airbus could probably save at least 1 billion euros ($1.27 billion) by dropping the smallest model and concentrating its engineering resources on developing the bigger and more expensive A350-1000, said Nick Cunningham, managing partner at Agency Partners in London. But the next movement is not clear; A350-800 could be cancelled, could be postponed or could be maintained. It will depend on future decision in the higher range of the family, with 787-10X and 777X by Boeing and a possible A350-1100 version, as the wide body market continue growing in quantity and in size. We shoul maintained tunned to Qatar next steps. Based on the article “Qatar drops A350-800 for larger -900” published in FlightGlobal and “Qatar Airways Swaps Airbus Smallest A350 for Larger Variants” published in Bloomberg. A350 XWB Roll out and first flight in 2013.